vivian Hutchinson is a trustee of the Jobs Research Trust, and the editor of the Jobs Letter. He is a long-time writer and activist on employment issues, and provider of social services in Taranaki. 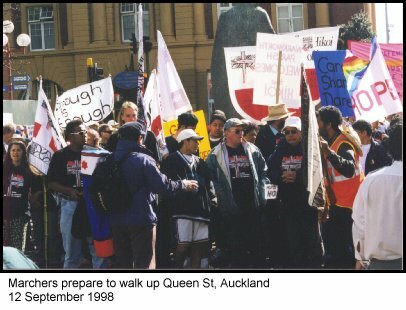 This paper is based on his speech to the Hikoi of Hope at Parawhenua Marae, Northland, on 2 September 1998.
if you've been waiting, you've been waiting too long "
I am here as one representative of the many social service people who agree with the sentiments of this hikoi and wish to get in behind it. I am not an Anglican ... I am here for the issues that this hikoi is walking for -- the call for real jobs, affordable housing, benefit and wage levels that move people out of poverty, a public health systemwe can trust, and accessible education. When those of us that are working in the community have stuck our neck out over issues such as unemployment and poverty, it has always been the various church-based social service and social justice people that have got in beside us. Now that the Anglican church is taking a lead with this hikoi -- and also taking the risk that they will be making a fool of themselves -- it's our turn to get out and walk and stand beside the church as it weathers both the praise and the criticisms for daring to make this dramatic call for change. But I do not think that this hikoi will be seen as an act of foolishness. The call for this walk has struck a chord with too many people outside of the church for it to be passed off simply as a religious display of concern. Sir Paul Reeves has described his hopes for this hikoi that it may in some way be seen as "timely". That is my wish also. I think it is timely for New Zealanders to start re-examining the choices we are making as a nation. If an institution such as the Anglican church -- middle New Zealand at prayer -- can help catalyse just such a re-examination ... then it would be "timely" indeed. I came up north to join this hikoi because, for me, Cape Reinga is not just a place of beginnings. It is also a place of letting go. Every New Zealander knows the mythology that the Cape is a place where the land lets go of the spirits of the dead. I came because I recognise that, if we are to successfully heal the social problems that lie before us, our country needs to also let something deeply go. And Cape Reinga is a perfect place to begin such a process of release. I actually wish that this hikoi was not taking place. Or more precisely: that this hikoi did not have to take place. As someone who has spent most of his adult life in social action and social services, I would wish that our efforts over the past generation had made a deeper difference to the direction that this country was heading. Actually, despite the daily personal victories in our work ... this is simply wishful thinking. The fact is that despite our efforts in the front lines of working with the poor and the unemployed, the "big picture" on social issues in this country has got steadily worse over the past 15 years. This is where the word "hope" comes in, because, if we are honest with ourselves, there are many people out there who are not feeling hopeful at all. And this hikoi needs to be respectful of the genuine hopelessness that people are feeling, and will express while on this walk. In my role with employment trusts, I get to meet and see many people at the front-line of social services around NZ. I'm here to tell you it is not a pretty sight. Whether it's the people running foodbanks or working with youth-at risk, or running government employment programmes, or dealing with emergency housing or community mental health services ... I am not seeing a healthy situation. The people that need our help are in a bad enough shape ... but the people who are running the social services I see are also over-whelmed, burnt out, angry and feeling hope-less. I have many colleagues who are not coping or slowly being sent mad or deeply depressed with the pressures they are facing on a daily basis. These people face ongoing funding cuts while their services have been asked to take more of the load of the social dislocation caused by current economic policies. I have watched a growing crisis of trusteeship within our communities as community agencies transform themselves to businesses competing for the shrinking welfare dollar. And we have all been watching the decimation of the social economy in our nation -- that part of our national life that works quietly behind the scenes for "a common good". The "third sector" of social and community services in New Zealand has been in a growing crisis for some time. Sure, the people at the front line continue to do great work every day in meeting the needs of those families and individuals that have been thrown to the edges of our economic system. But very little of what they are doing is having an effect on "the big picture" -- the problems are continuing to get worse. The sense of hope-lessness in our community is a very tangible thing. We would wish it was not there ... but it is not a thing to avoid looking at. And when faced with this perspective, a very appropriate response is grief. We have very few public opportunities as a country to express our deep grief at what has happened to us over the past 15 years. This is another face of this hikoi, and something that needs to be taken more seriously. The walking we do may outwardly seem futile -- but actually it is an inner journey that many of us are taking over this month. On a personal level, many people will be joining this walk as a way of expressing the grief they feel for what has been done to the potential of this country. This griefwork is one of the spiritual tasks of this walk. In this respect, the hikoi is not a celebration. It is not a chance to wave a flag or walk down a main street singing "glory hallelujah". The hikoi is a ritual of healing and empowerment. Through walking ... we ask that the sadness we feel for this country, and many of its people, be transformed. Through walking ... we take back that inner power we need in order to keep working for change. Through walking ... our grief turns, and we start to feel the empowerment we need for the serious work ahead. This griefwork is not a task you give to children. This is why this walk has to be seriously carried and cloaked by the leaders of this church and the elders of the communities through which it is walking. One of the aspects of our appalling statistics in youth suicide is that we have grown a culture which is asking its young to bear too much of the un-eaten grief of its adults. We have to turn this around -- it is the job of adults and elders to face the social sadness before us, and not leave it as a legacy to our children. It is actually the adults that need to "grow up" at this time. And perhaps this hikoi can be part of a process of us growing up as a nation ... enabling us to face the shadows that are there within the choices that our leaders and politicians have been making for too long. 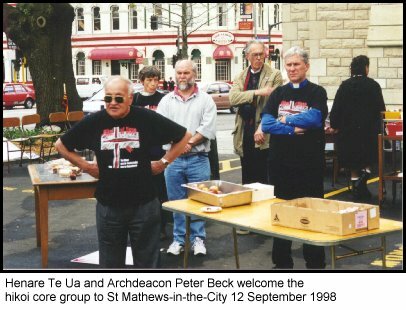 The tradition of hikoi is not just rooted in the theologies of the Old Testament and historical walks to freedom of the Holy Land 2000 years ago. 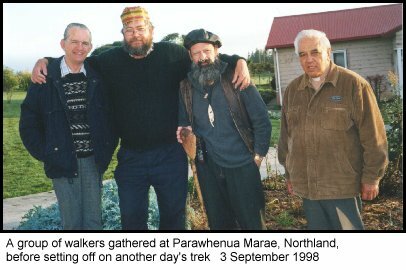 In our short history as a nation, we too have had many expressions of hikoi -- the Taranaki prophets Te Ua Haumene, Tohu Kakahi and Te Whiti o Rongomai led many peace walks in Taranaki in response to the land confiscations of last century. 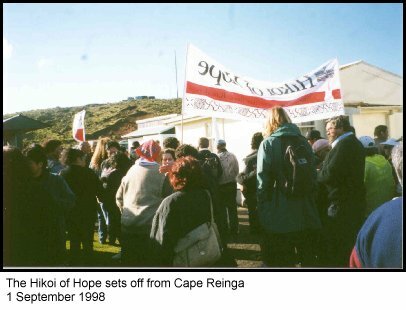 In more recent years, Whina Cooper's Maori land march of 1975, and the more recent annual hikoi to Waitangi have been of immense value in shifting the attention and heart of our country to the justice issues between Maori and Pakeha. I was one of the organisers involved with Whina Cooper's march, and that is another reason why I came here to the north for this hikoi. There are many echos here for me of that event 23 years ago. When I see the young people of Hokianga walking down these roads in bare feet ... I remember their elders and older brothers and sisters who also walked these roads in the 1970s. I hear the echo of Whina's invocation repeated daily during her walk: te ihi, te mana, te tapu -- maranga ra! Whina's march was also an expression of grief. It was an expression of the hopelessness felt by many campaigners for justice on the Ngatiwai lands and the Raglan lands, and the similar claims that were all over the country. 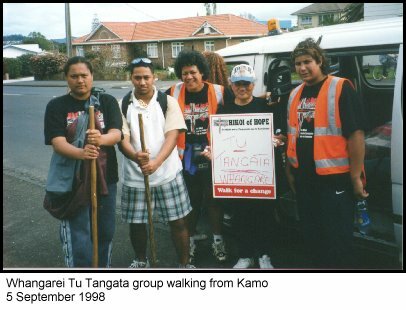 I was a young journalist at the time and was at Mangere Marae when the idea of the land march unfolded. 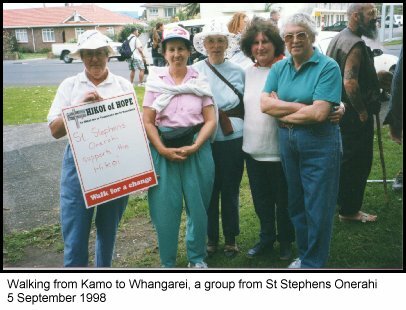 It was a story not unlike the way the birth of the Anglican hikoi emerged from its Synod in May this year. People stood and shared their feelings of utter frustration at not getting anywhere on their lands issues after several generations of submissions and delegations to parliament. People were over-whelmed, burnt out, and angry. For these people, the land march indeed proved to be a ritual of healing and empowerment. The 1975 land march was held at a time when there was no such thing as the Maori renaissance that we know today. But the march was "timely". We started out at Cape Reinga with only 40 people. By the time it reached the steps of parliament grounds, over 50,000 people had taken part. And after the march, the renaissance for Maoridom was certainly unstoppable. My hopes are that this Anglican Hikoi of Hope can also lead to a renaissance for the poor and the unemployed in New Zealand. This is about walking to change what we value. I want to see that the contributions of the poor and the unemployed are be valued more in this country. I want to see their right to participation, their right to a fair share of the country's income, their right to a place at the table to have their say ... is honoured within our political and economic framework. I once heard a lecture by the British economist Fritz Schumacher, one of the elders in the movement for an economics "as if people mattered". Schumacher said that "the in-born creativity of all people is no mean or accidental thing. Neglect it," he said, "and it becomes an inner source of poison ..."
What we have heard through the story-telling during this hikoi so far, are graphic tales of how this poison is working its way through the bloodstream of our nation. We have heard how this poison is working its way through the rot of joblessness, nothing-in-the-bank, homelessness, ill-health, and an education system that is failing its young. These are heavy stories to carry, and must be carried forward with care. Schumacher also believed that nothing can stop the flowering of a society that manages to give free rein to the creativity of all its people. That is our task today: making sure those at the edges of economy have clear opportunities for participation and livelihood. The reward for this work will indeed be the flowering of us as a wider nation. I am not just here for the issues we are walking for, and the stories we have been asked to carry. I am also here to help defend the integrity of these issues. The last thing the poor and the unemployed need these days is the appropriation of their suffering into a religious gesture. Churches generally have been in the business of marketing `hope' to the poor for many hundreds of years ... with very mixed results. But when hundreds of people do indeed join us on this hikoi over the next few weeks, they will not be "marching for Jesus", or participating in some sort of revival of Anglicanism. They will be marching for the issues: for jobs, housing, health and education. They will be marching in response to Bishop Whakahuihui Vercoe's "people power" sermons. They will be turning up for Paul Reeves' sense of "timeliness". It will be a challenge for the church to actively embrace the diversity of the people who will be coming and joining in with this hikoi. And it will be an ongoing challenge to the character of the church to let the poor and the unemployed, and those also working at the forefront of social services, speak for themselves ... and not smother them with hospitality, prayer and ritual. I had actually hoped that "middle" New Zealand would have been stirred into action long before now. I am mindful of the Dave Dobbyn song that is in the music charts right now where he sings: "If you've been waiting, you've been waiting too long ..." Dobbyn sings of a country "where darkness is slow turning". It is not a hopeful song. In fact, it is a condemnation of our passivity. Martin Luther King said that we will have to "repent" in this generation "...not so much for the evil deeds of the wicked people, but for the appalling silence of the good people." King was another walker. And perhaps this hikoi will help in some way to turn around that appalling silence within "middle" New Zealand. I can already see that this walk is going to be just as much a wake-up call to the Anglican church, as it hopes to be for the country as a whole. It is clear enough that the church -- like all of us -- is as much inter-woven with the problems, as it is with the solutions it seeks to advocate on this hikoi. I only hope that the church does not get overwhelmed by the details of this unfolding exercise, and lose sight of the longer-term tasks that will still face us all after the hikoi finishes on October 1st. For all its good work with its Anglican Social Commissioners, the church has only just begun to walk down this particular road in "working for change". Part of the "growing up" that will happen as a part of this hikoi is the wider realisation that things won't change in this country just because we think it would be a good idea. The unspoken story is this: there is a great deal of energy going into keeping things exactly as they are right now. Poverty and unemployment are not a mistake of political or economic design ... they are the consequential expression of a system that is serving other goals. Things will only change when we challenge these existing goals, and work for a political and economic system ... as if people and the earth really do matter. These changes will require a much longer-term commitment to a process of social justice, a commitment that I hope will have its genesis for many people in their participation with this hikoi. A longer-term plan for change will involve resourcing good research, a wider education of the church membership and the community, actively growing and supporting the people needed to take leadership on social issues, and building the relationships needed across the many organisations who are also working in social services and for social justice. So this hikoi may well be on a road longer than the road to Wellington. I am very grateful that the church is walking, and that we all do have the opportunity to join in. It is a privilege to be here. I am left with the hope that our efforts will indeed be part of the path to change ... and that the next generation will not find it necessary to walk these roads again in another 20 years time.